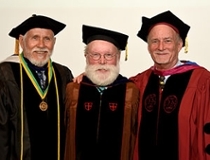 During the May 4 History Department graduation ceremony, departmental icons Larry Usilton, Walter Conser and Chris Fonvielle were presented with the Order of the Long Leaf Pine award, in recognition of their outstanding contributions to their field, students, peers, and communities. 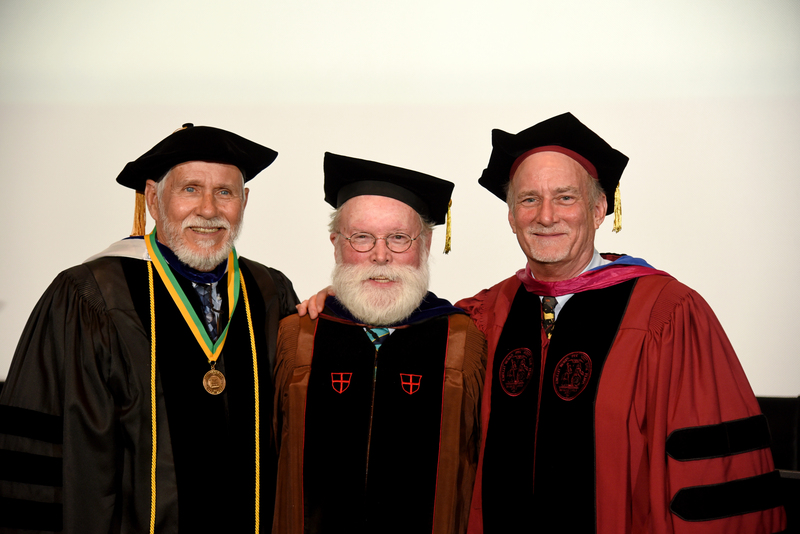 The awards come as a final tribute to three stellar professors, as Fonvielle and Conser are retiring this year and Usilton is beginning phased retirement. Since 1963, North Carolina’s governors have reserved their highest honor, The Order of the Long Leaf Pine award, for those who have made significant contributions to the state and their communities through their exemplary service and exceptional accomplishments. Each recipient is considered an honorary ambassador to the state. To be considered, individuals must be nominated and have three references attesting to their commitment and dedication to their communities. UNC System Director of Media Relations Jason Tyson ’02 was at the ceremony to present the awards and pay homage to a few of the professors who helped shape his life. Part of UNCW’s Strategic Plan is the pursuit of excellence in teaching, research and service.